Veteran B.C. steep slope logging specialists Dennis and Brian Hoobanoff are praising the productivity of their new purpose-built Tigercat LX830C tilter feller buncher, which anchors the company’s logging equipment fleet. Dennis and Brian Hoobanoff can look back now and laugh at some of the “flavors of the day” that have guided British Columbia forest management practices over the years and feel completely satisfied that they have survived and created something valuable and memorable with their logging company. 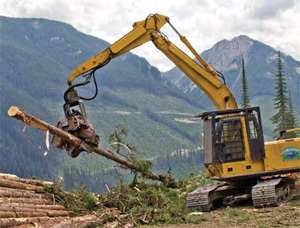 The brothers own Hoobanoff Logging, based in Canal Flats, B.C. It has survived forest fires like the one in 1985 that wiped out about 30 years of merchantable timber in this area of southeastern British Columbia, several forest industry recessions, and all sorts of new theories on how to improve forest management practices. Hoobanoff Logging says the Tigercat LX830C steep slope feller buncher is about the only piece of equipment with the reach that they need for the mountainous environment where they work, in southeastern B.C. “Over the time we have spent here, there have been many changes,” says Dennis. “You build your company or you downsize your company or you change your machinery—all that is done in order to survive. You have to go with the flow.” They are currently a tree length, stump-to-deck contractor and have become specialists in steep slope logging. That is reflected in their equipment selection with both a tilter feller buncher and grapple yarder in their fleet. Hoobanoff Logging was founded by Dennis and Brian’s father, Peter Hoobanoff, in 1963. They moved to Canal Flats in 1968 and began working for Crestbrook Forest Industries, which was later purchased by Tembec. They have continued to contract their services to Tembec, but will soon be working for Canfor. In November, Canfor announced it had signed an agreement to purchase Tembec’s Elko and Canal Flats sawmills and approximately 1.1 million cubic metres of combined Crown, private land and contract annual allowable cut. Hoobanoff Logging’s history is a snapshot of how much more mechanized, productive and safer the industry has become compared to how labor-intensive and dangerous logging used to be. Still not necessarily an occupation for rookies and the faint of heart, especially working in the steep slope environment of the B.C. Interior mountain ranges, equipment like their purpose-built Tigercat LX830C tilter feller buncher, which anchors the company’s fleet today, makes for a much safer and productive job site. Hoobanoff Logging has come a long way since the four hand fallers, five skidders and three crawler tractors it employed before switching to mechanical logging in 1974. However, the company’s evolution to a totally mechanized, steep slope operation wasn’t a straight line. 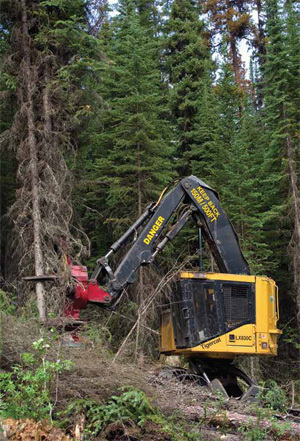 After adopting mechanical logging in 1974, the company returned to hand falling in the early 1990s because of massive forest fires and the lack of a fibre resource to support mechanical logging. At that time, the company also ventured into yarding. There are pros and cons to how the industry has evolved. While there are fewer contractors, there is more annual allowable cut available to the remaining contractors, which encourages more equipment purchases and larger fleets. It’s also much easier to develop a business plan around a larger quota when business owners can expect a better return for their effort and where employees can expect a steady paycheque. Based on the enthusiasm that the Hoobanoff brothers still express for their business, it seems that neither Dennis nor Brian would trade any of the experiences or the environment that they have worked in over the company’s nearly 50 years in business. It’s certainly given them some interesting stories to tell. One of the most unusual refers to the requirement to peer though a prism to calculate how many trees could be removed from a cutblock. Logging in the Purcell Mountains near Canal Flats, B.C. is no job for rookies, and Hoobanoff Logging, with nearly 50 years experience in forestry, are steep slope logging specialists. 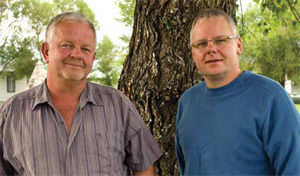 Hoobanoff Logging’s co-owners are Dennis (left) and Brian Hoobanoff. He adds that forest management has changed with each new provincial government. Some had a thick book on forest practice codes, which proved to be expensive. To this day, Hoobanoff Logging believes that forest retention, wildlife and water are very important issues. The forest management changes had a lot to do with the former NDP government’s tinkering with B.C.’s Forest Practices Code, which required different approaches to logging. For example, the requirement to use smaller crawler dozers related to the desire to reduce site disturbance and increase forest retention—an admirable objective on paper, but ultimately proving too costly. Among Hoobanoff Logging’s main challenges these days is to keep ahead of the mountain pine beetle in this area of B.C., a region that features some of the most pristine and picturesque scenery in the province. The main feature is Columbia Lake, which begins at Canal Flats and is the source of the mighty Columbia River. “The valley” as it is commonly known locally is nestled between the Rocky and Purcell mountain ranges, which means that building roads, logging, and transporting the logs nearly always involves fairly steep slopes. “When this last batch of mountain pine beetle hit hard again, that’s when we went back to mechanical logging,” says Dennis. “That’s when it went wide open to go chase after the pine beetle and we are still chasing the pine beetle. The Hoobanoffs operate a modern mechanized logging fleet that includes a new Tigercat LX830C tilter feller buncher for steep slope logging, a Tigercat 620E skidder with a 19G grapple, a new Caterpillar 545C skidder with a 19G grapple, two Caterpillar 525B skidders, a steep slope Caterpillar 527 crawler tractor, a Caterpillar 324D carrier with a Waratah 622B processor head, and a John Deere 200LC carrier with a Waratah HTH20TR processing head. They also have two excavators—a Caterpillar 320 and a Link-Belt 210 for trail reclamation and road building. With the steep slopes they work in, Hoobanoff Logging also has a yarding operation that features a Thunderbird TSY50 grapple yarder working with an EL300 backspar. Rounding out their fleet is a self-loading, T800 Kenworth logging truck. Hoobanoff Logging tends to rotate its major pieces of equipment like its feller bunchers and skidders every four years. This is the company’s second Tigercat LX830C tilter feller buncher. Chasing the mountain pine beetle is one reason why despite an annual allowable cut of about 85,000 cubic metres, Hoobanoff Logging is actually harvesting over 100,000 cubic metres these days. Brian adds that the Tigercat LX830C has impressive tractive effort— climbing the slopes and in the right conditions, the operator feels comfortable working on up to 60 per cent slopes. In terms of purchasing new equipment, they feel it is a good time to buy because of the current favorable exchange rate between the Canadian and American dollar, but the major unknown is where the economy is headed and how that will affect the forest industry. At present, the company has 15 employees, and for the past couple of years has been harvesting over 100,000 cubic metres per year. Hoobanoff Logging will harvest wood using their Tigercat tilting feller buncher, then will deploy their grapple skidders to skid the wood. Their grapple yarder is used to retrieve wood for anything above a 45 per cent slope. With the yarding operation, they can retrieve and transport logs in as much as 70 per cent slope, which is essential is this part of B.C. Although they are currently harvesting over 100,000 cubic metres, their contract with Tembec is for 85,000, which consists of 35,000 cubic metres from the grapple yarding operation and 50,000 cubic metres from conventional logging. Their wood diet around Canal Flats is quite varied and consists of lodgepole pine, spruce, balsam fir, and western larch, as compared to areas further north where pine is predominant. Average diameter is in the 10” to 12” range, with the fir and larch a little larger. There are three basic sorts as roadside, which the company describes as whitewood, redwood and pulp. The spruce, balsam fir and pine fall into the whitewood category with larch and fir described as redwood. 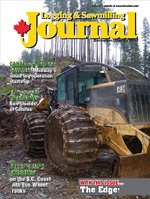 The major challenge Hoobanoff Logging and other forest contractors face at present in this part of B.C. is competition with area mines for employees, which is one reason why it is so hard to find hand fallers and why it is so hard to attract young people to the industry. It’s one reason why a major focus at Hoobanoff Logging is keeping their employees happy—and because they have learned from experience that having contented employees translates into good production numbers.